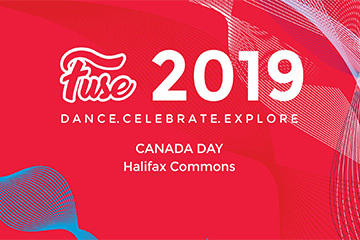 FUSE is a bi-annual dance festival first presented in Halifax on Canada Day 2017 thanks to a Canada 150 Fund. FUSE celebrates Canada’s diversity through dance. Our vision is to bring together Canadians of all cultural backgrounds through a shared cultural dance experience across many genres. Our mission is to feature Canada’s cultural diversity and creativity through dance by combining community and artistic excellence. The idea of FUSE is to celebrate and explore diversity through dance and to find common ground between various dance styles and cultures present in our province. FUSE is produced by Atlantic Flamenco Productions Society (AFP), a nonprofit Halifax based organization whose mandate is to promote and disseminate dance, flamenco and Spanish culture in the Atlantic region. AFP also produces the Atlantic Flamenco Festival, the Flamenco Nights performance series and creations by Maria Osende Flamenco Company.